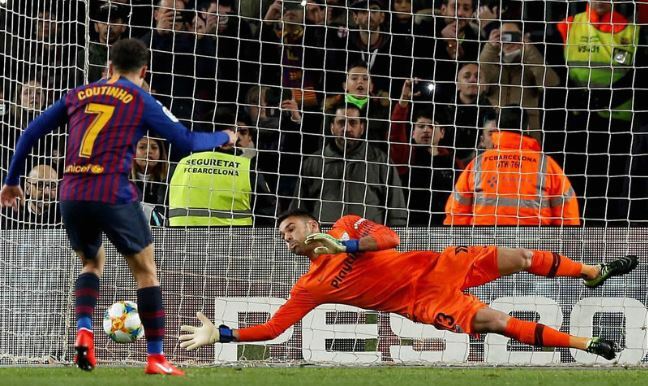 Barcelona beat Sevilla 6-1 at the Camp Nou on Wednesday to make it to the Copa del Rey semi-finals 6-3 on aggregate. They were 2-0 down from the first leg but had Lionel Messi back in the starting line-up after having missed the first game and he won a penalty which Philippe Coutinho scored on 13 minutes. Jasper Cillessen then saved an Ever Banega penalty and Sevilla paid for the miss conceding again on 32 minutes through Ivan Rakitic. Coutinho scored again on 53 minutes and Sergio Roberto made it four a minute later. Guilherme Arana pulled a goal back but Luis Suarez and Messi completed the route late-on. “It’s a massive disappointment,” said Sevilla coach Pablo Machin. Betis join Barcelona and Valencia in Friday’s semi-final draw after beating Espanyol 3-1 to win 4-2 on aggregate. Real Madrid defend a 4-2 lead away at Girona in Thursday’s final quarter-final.